Patrick Cartier of Brookfield East keeps busy year around. When he's not in the classroom, Cartier is active in three prep sports from fall through spring. Quentin and Maria Cartier had four kids and sports is big in the Cartier household. Patrick and his twin brother Everett, go to East; Dominic attends the University of Minnesota and sister Maddie attends St. Louis University. Patrick currently teams with Everett, a tackle, on the football team, and played football and basketball with Dominic, also an outstanding prep athlete. This past fall he was a starter on the State Champion Brookfield East football team at receiver and when needed, he stepped in at safety. 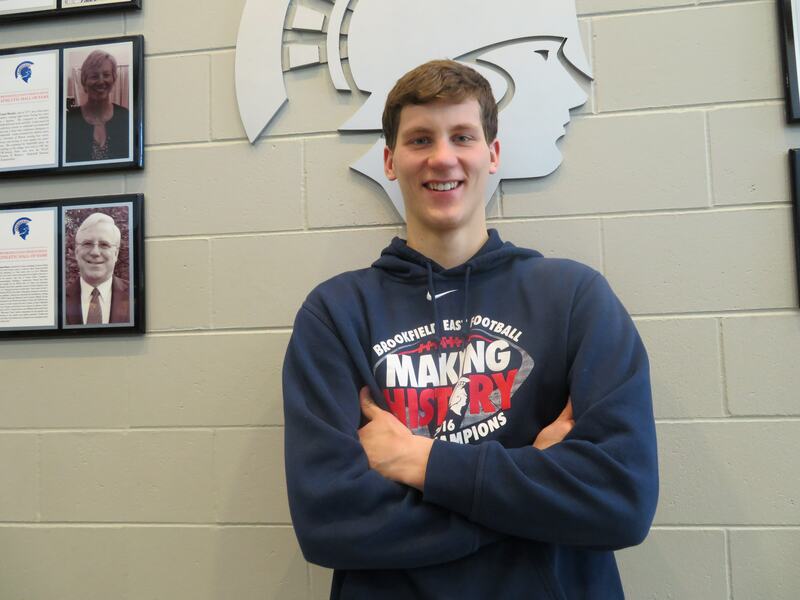 This past winter he started at center for a young, improved Spartans basketball team and earned All-Greater Metro Conference honors. Now with spring upon us, Cartier brings his skills to Coach Mike Steiner's talented track and field team, taking part in the 110 and 300 hurdles, the triple jump and high jump. "He is truly committed to the team process," Steiner said. "He's a good teammate, hard worker, not afraid of challenge. He functions at a high level and is respectable in all his events. "When you talk about his skill sets, his training is excellent in multi-sports. He is also flexible and explosive." With two spring seasons ahead of him yet, Steiner talked about what Cartier needs to work on. "Kids are all trying to get faster," he said. "He is working on getting a better vertical jump. He has a competitive spirit and he works on developing strength and speed." Cartier first got into track in the fifth grade at St. Dominic's. "I participated in the sprints and jumps because they didn't have hurdles at that level," Cartier recalled. "Track helped me with my other sports and I loved competing and a lot of my friends were doing it so it was always fun for me." Cartier, who stands 6-foot, 8 inches and weights 205 pounds, feels his height is an advantage for him. "Being taller, I bring an advantage," he said. "I'm above the hurdle already. I have pretty good form." Cartier is pleased to be part of Steiner's program, which has won several Greater Metro Conference titles, as well as state championships. "Coach is awesome," he said. "He does a great job in getting guys involved. Obviously he's had so much success. It's great to be part of this program. They three-peated a little while ago. "I'm blessed. Coach Steiner does a great job of putting guys in their events, recruiting guys, keeping people involved." Cartier had a dream season during the fall as the Spartans won the school's first football state championship. In fact, he played a key role, catching a 22-yard touchdown pass from quarterback Jake Graf with 50 seconds left in the half to tie the score, 21-21, at halftime. "It was unbelievable," Cartier said. "Even now, looking back months later it is hard to believe we won the state title." First-year head coach - Ben Farley - had good things to say about his junior wide receiver. "He was a big target for us," he said. "His touchdown in the title game before half gave us some momentum. He is a hard worker, a physical player. "His route running ability was very strong and he had good footwork, which you can see on the basketball court. He can go get the football and catch the ball. He is also a physical blocker, smart, athletic." Cartier agreed with his coach when asked about his strength on the gridiron. "Going up and getting balls with my reach," he said. Cartier has been started playing football in the third grade when he played flag football. He joined the Jr. Spartans in fifth grade. "I was a lineman because I was over the weight limit," he laughed. Then in seventh grade I played receiver." So why did he stay with it. "I like the physical nature of it. I had success in it. I like the winning part of it (laughs). It was a fun sport." Cartier was on the freshman team at East before moving up to the varsity as a sophomore, getting about 20 plays a game in a rotation. Last fall the Spartans ran most of the time behind the efforts of Sam Santiago-Lloyd and Graf, but Cartier did lead the team in most receiving statistics. He caught 14 passes for 235 yards and 3 touchdowns, averaging an impressive 16.8 yards per catch. But of the three sports he plays, Cartier's future is on the basketball court. He has started on the varsity the past two seasons. As a sophomore he was third in scoring (10.6) and points scored, tied for second in field goals and he led the team in free throw attempts, doing most of his work inside. This past season he earned first-team All-GMC honors, finishing first in field goals made, free throws made and attempted and second in points and a 16.8 points per game average. "He did a really nice job handling the amount of offensive responsibility we gave him," first-year coach Joe Rux said. "He carried a lot. He has to score around the basket for us, but he is not your typical big man. He really moves well. "He is a heck of a post-player. He has outstanding footwork and he has several moves. He added a jump shot this year. Now if he can concentrate the same dynamic on the defensive end that would give him a good all-around game. He's a pretty tough high school player." "My post-up game has really come along," he said. "I also think I have pretty good passing ability for a big guy." Patrick's basketball career began in first grade, playing in the Upward League Church League. Then in fourth grade he played for the Jr. Spartans and fifth and sixth grades played at St. Dominic's. 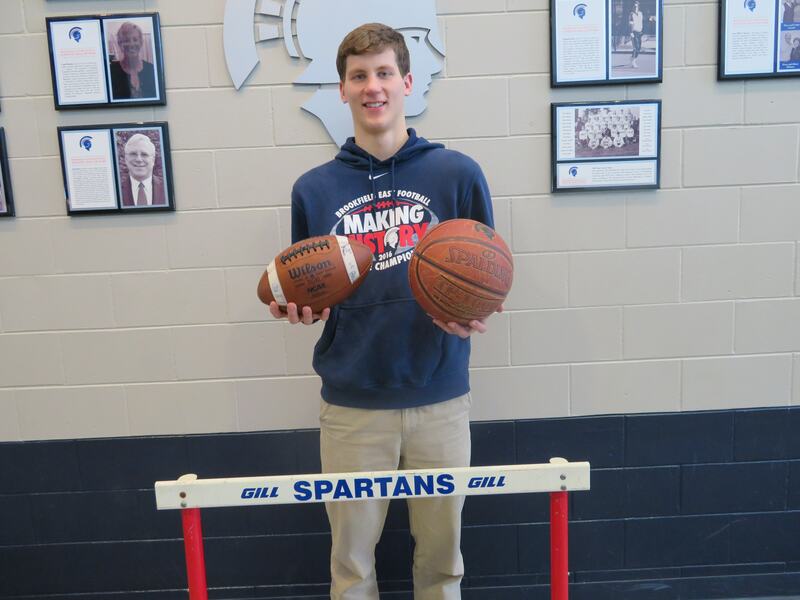 He was really busy in seventh and eighth grades playing for both the Jr. Spartans and St. Dominic's. "I felt like I had a knack for it," Cartier said when asked about why he continued with the sport. "My friends were doing it. It was just really fun to play. My dad was coach in middle school so I got raised into it with my family. I was always one of the taller kids. I just kept growing. I didn't really slow down." Cartier knows that next season he is going to have to take on a leadership role being a senior and a top player. "Leadership is very important," he said. "Every team needs a leader. Some guys who step up towards the end of games. Getting guys in the weight room, getting guys to come in and shoot around. This year I started getting the hang of it. I enjoy it." His coaches see him developing his leadership skills. "He is always trying his hardest," Rux said. "He's one of those kids, if things weren't going well he would address it. He holds himself and his teammates accountable." Farley sees Cartier coming around also. "He leads by example," he said. "But he will speak up - not a ton - but he is slowly getting more comfortable with it." "He leads with his work ethic and presence, but he is not quiet," Steiner said. "He doesn't back down. He shows that he respects them. When he goes out for track other athletes see that and figure track must be important." That's the kind of example Patrick Cartier brings to the table. FAVORITE PLACE YOU VISITED: Nothern Wisconsin, Florence County.